In its sixth year atop the York Hill Campus, the TD Bank Sports Center has seen a variety of events. 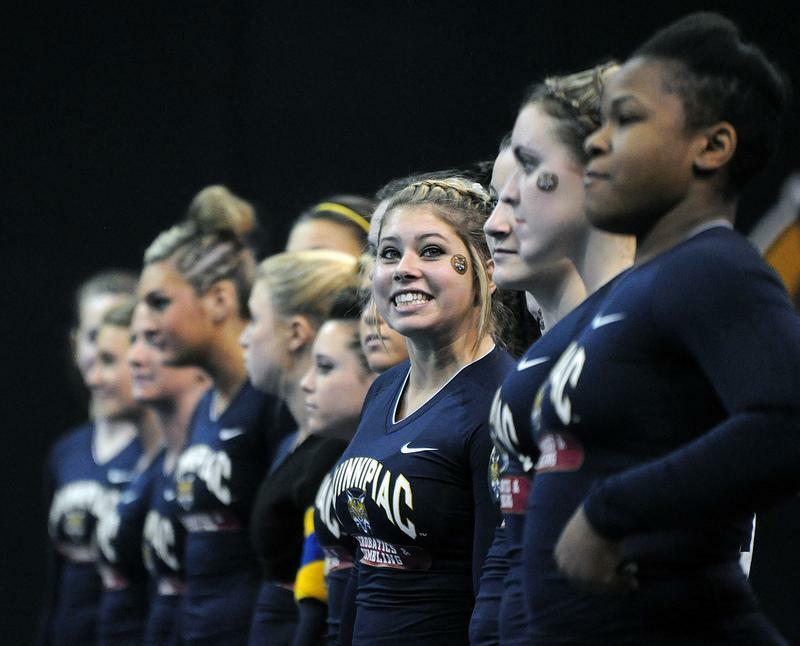 But on the weekend of April 25-27, it hosted the National Collegiate Acrobatics and Tumbling Association’s national championship for the first time with the host Quinnipiac Bobcats ranked as the No. 2 seed. Despite losing in the championship meet, Quinnipiac had major schools such as Baylor and Oregon coming through its doors and those administrators were blown away by their preparations for the event, something that head coach Mary Ann Powers was proud of after the national championship. Oregon head coach Felecia Mulkey said what made the event so great was putting the student-athletes first. Planning the event was certainly not something that happened overnight, as Executive Director of the TD Bank Sports Center Eric Grgurich said. It took well over a year to plan out the three-day competition. During the winter season at the TD Bank Sports Center, the men’s and women’s basketball and hockey teams have many games which provide plenty of opportunities to work out logistics of each day. The acrobatics and tumbling team only hosted two meets all season, not exactly a lot of time to plan out how to run the event. One person both Powers and Grgurich mentioned who played a major role in planning the event was Associate Director of Academics Lyneene Richardson. Richardson received praise from her entire team, and she said the event wouldn’t have been possible without them. This teamwork really became crucial in the home stretch as Grgurich and many of the Athletic Department employees were traveling with the men’s ice hockey team on its journey to Pittsburgh and were away from the office more than anticipated. Hosting the NCATA Championship for the first time certainly did not make it any easier on this planning committee as well. “It’s just something we haven’t hosted before, obviously the first time you’re doing things you’re working out the kinks and kind of going to the meetings to get everything squared away,” Grgurich said. Once the championship weekend got underway, it was the electricity in the building that took over as both championship meet teams, Quinnipiac and Oregon, were well represented in the stands to cheer on their respective teams. Hundreds of students came out to cheer on their peers, something that Grgurich was happy to see. “I think the athletes did a great job of getting their roommates and friends to come out and obviously they’re very loyal and into it, so it’s great to here in there,” Grgurich said. In Quinnipiac’s opening meet, they defeated Azusa Pacific before falling to Oregon in the NCATA championship meet. With Oregon’s victory, they won their third straight undefeated title. When it comes to hosting the event again in the future, Powers says she would love to get the honor again but is not so sure if that opportunity will come in the near future, if ever again with the addition of five more teams to the NCATA. Whether or not Quinnipiac hosts the NCATA championship again, Mulkey pointed out that she would not be opposed to coming back to Hamden again next season.